This sturdy swing set structure supports wheelchair platforms with weight up to 700 lbs. Available with 1 or 2 platforms. 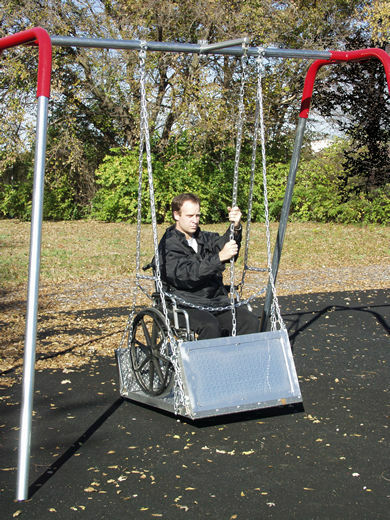 This accessible swing and frame is ADA compliant for your special needs wheelchair users. Models with 1 platform or 2 are available (note: the models for 2 platforms separate the platforms into 2 “bays”; the 2 platforms do not swing next to each other). These structures are available in sizes for adult users or juvenile user. The platforms can handle both manual and motorized wheelchairs. The front and rear ramps offer easy access onto and off the platform, which has a non-skid design. The platform is made from tough aluminum. It can be attached to almost any frame, and may be purchased separately. This is a to-fro swing; that is, it moves forward and backwards, and it does not rotate. You can also order a separate pull-chain mechanism that lets users propel themselves. Swing Platform with Frame has a weight capacity of 700 lbs. Note: Standard adult wheelchair measures 30″ W x 48 ” L.
Standard entry for adult accessible playground structures is 36″. Please phone us for more information and pricing of the structure with dual swing platforms. Pull chain mechanism comes with attachment and may be added to any frame. Got questions about the Swing Platform? Call us TOLL FREE.